Right in Florida Tech’s backyard is the Indian River Lagoon, home to more than 3,000 species of plants and animals that are suffering from a half-century of neglect and pollution. As more people have made the Space Coast their home and increased development and pressure on the lagoon, marine life has been decimated by a deadly chain reaction started from fertilizer run-off and waste water. The lagoon is now home to a massive build-up of muck, a thick mixture of nitrogen and phosphorus that resembles black tar. In some parts of the lagoon, the muck has reached epic proportions, up to 10 feet high, suffocating seagrass beds, a vital part of the lagoon’s eco-system. Muck is contributing to large scale algae blooms which consume massive amounts of oxygen, choking out marine life. Now, the lagoon is afflicted with massive die-offs fish, sea turtles, manatees and dolphins. Through concerted research efforts, Florida Tech faculty and students are developing solutions to the Indian River Lagoon’s dire situation. A group of more than 20 faculty members with decades of scientific research experience related to the Indian River Lagoon have come together to form the Indian River Lagoon Research Institute (IRLRI). Collectively, Florida Tech scientists and engineers are developing solutions to the major issues plaguing the health of the lagoon, including muck and nutrients, lagoon flow, nutrient reduction, sediment loading, ecosystem recovery, policy and management, and engineering technologies. Part of the mission of the IRLRI also includes outreach and education to help the community and lagoon stakeholders understand the importance of IRL problems and their role in creating solutions. The IRLRI collaborates with numerous institutions and agencies along the lagoon with the common goal of improving the lagoon’s eco-system. There are many ways to help improve the health of the Indian River Lagoon, from adopting eco-conscience landscaping practices like reducing fertilizer usage, preventing grass clippings from going down storm drains and growing Florida-friendly native plants to simple things like picking up trash and after your pet. Little actions can go a long way. Attend TechCon2018. Join us during our annual Technical Conference on Coastal Water Quality hosted by the Indian River Lagoon Research Institute. The conference is focused on adapting and applying science to guide management decisions and develop solutions aimed at improving coastal water quality. Ready to help restore the Indian River Lagoon? 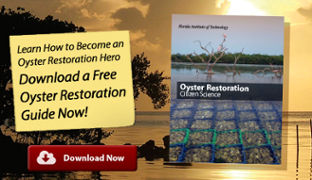 Check out our Oyster Restoration guide and learn how you and a colony of oysters can make the lagoon a more hospitable environment for marine life. A series of informational forums focused on the Indian River Lagoon health, with the goal of connecting scientists, engineers, citizens, and municipalities in a joint effort to find solutions.